In Mass Communication class we talked about propaganda. Propaganda is typically divided into three categories: black, white, and gray. White Propaganda intentionally suppresses potentially harmful information and ideas, and promotes positive information and ideas, to distract attention from problematic events. Also, the source of the message is known. Black Propaganda is the deliberate and strategic propagation of lies, and often the source does not make itself known. Gray Propaganda is the transmission of ideas or information that may or may not be false—no effort is made to determine their validity. The source may or may not be known. I made the poster above after reading the recent news about the CIA’s past use of torture in interrogation. 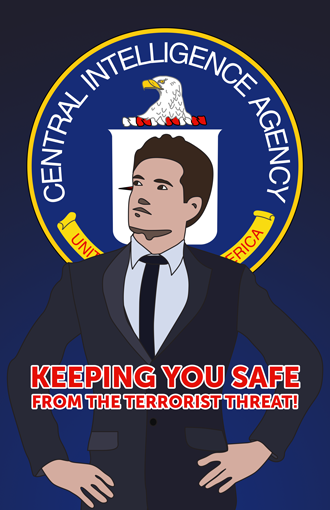 The poster I made would be an example of white propaganda, since it suppresses negative information (the CIA’s use of torture) and promotes a positive idea (that the CIA keeps you safe). Really nice poster! I like the vivid colors!